There is an additional HRC-instrumental blur for high-rate sources, a "pile-up" effect. Events that are affected can be flagged and filtered out based on their proximity in time and position to a previous event. 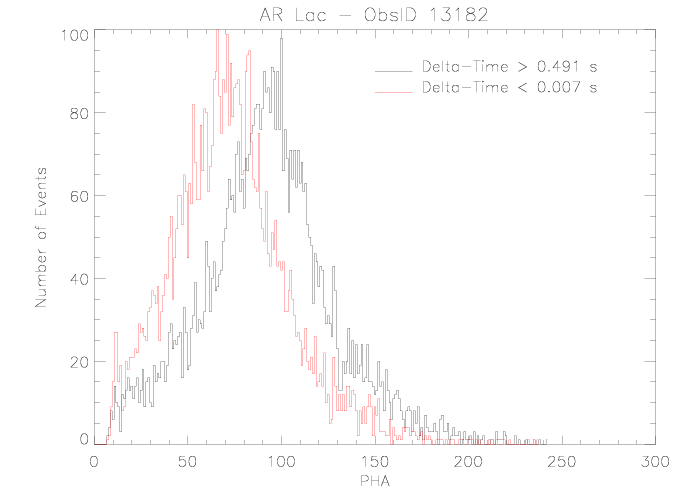 Two HRC-I observations of AR Lac (ObsIDs 1385 and 13182) have been used to study the system PSF. The source flux varied during both of these observations and it was noted that the PSF was broader during the intervals of higher flux. In addition, observations of Capella, which produces a higher count rate than AR Lac, exhibited a broader PSF than AR Lac. During ground calibration at the XRCF a set of data was taken to probe the linearity of the HRC count rate with flux. One analysis that was performed with the data was to compare the linearity of the core of the PSF with a surrounding annulus (see section 3.3 of "Count Rate Linearity of the AXAF High Resolution Camera (HRC)") and observed that the core deviated at lower rate than the annulus. These measurements suggest that the increasing width of the PSF at higher count rates is due to a suppression of the peak in the core of the nominal PSF. The cascade down the channels of the MCP from an event extracts ~107 electrons from a very localized region. The glass in the plates has a high resistivity and the current flow required to replenish the charge lost to the event will take a finite time. Thus it is expected that the channels will not produce the nominal response of a second event comes too soon after the first. This is an effect of event pile-up. We can gauge the time-scale that it takes to replenish the local charge using the AR Lac and Capella observations, looking for changes in the size of the PSF as the time between successive events is decreased. For each observation we select the events from the nominal filtered event-list that lie within a 20-pixel radius centered on the iteratively-clipped centroid of the point-source events. Then, using all of the level-1 events in this same region, we determine the time from the previous event (the delta-time). The events can be grouped based on their delta-times, setting delta-time bin boundaries such that each of the bins contain roughly equal events. For each of the groups the radius which encircles ~85% of the events can be determined. 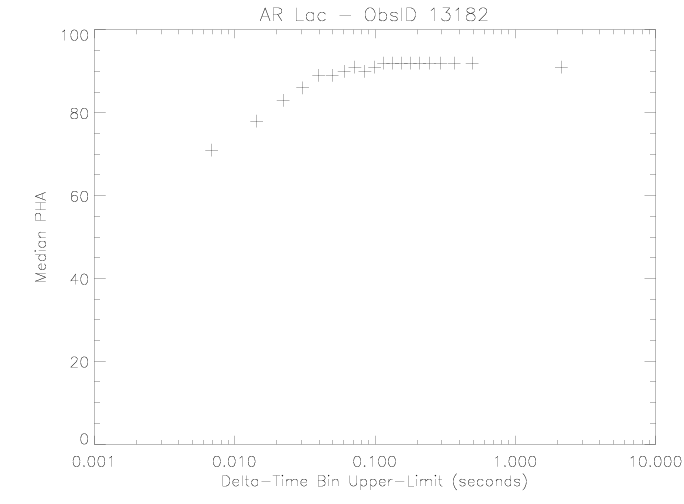 The figure below shows this radius as a function of the upper-limit on the delta-time bin for the two AR Lac observations and a Capella observation at the nominal HRC-I aim-point (ObsID 8360). The data points in all three observations overlap and show the same trend in increasing radius as the time between events decreases. Roughly speaking, a second event in the local region arriving within 0.05s of a previous event will have been impacted by the prior event. 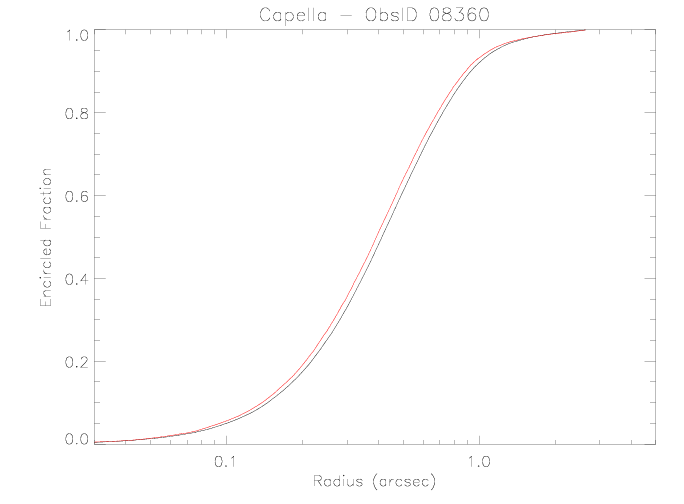 The figure below shows a comparison of the encircled count fraction as a function of radius for the Capella observation ObsID 8360 with (red curve) and without (black curve) the added "pile-up" filter described here. The XRCF tests showed the the HRC-S rate started its drop-off relative to source flux at higher flux levels that the HRC-I. This could result in the choice of different filter parameters for the HRC-S. 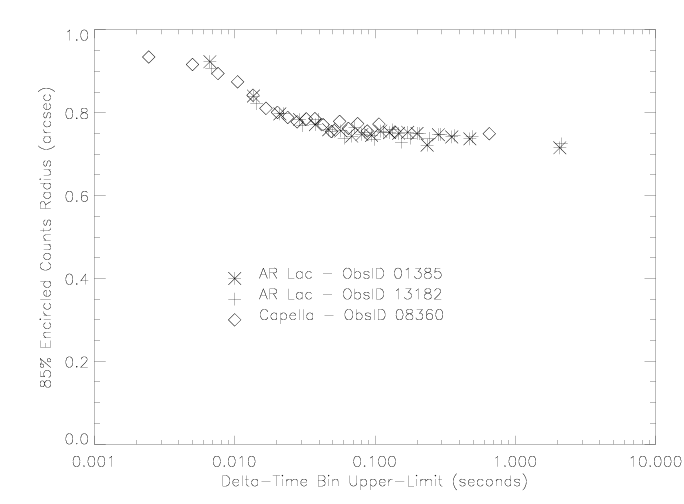 The figure below shows a comparison of the 85% encircled counts radius as a function of the delta-time bins between HRC-I and HRC-S observations of Capella. For the HRC-S the radius grows at a slower rate with delta-time decrease than in the HRC-I. However, the onset of the increase occurs at roughly the same delta-time. It is reasonable to use same filter parameters with both detectors. The lack of charge replenishment can be expected to have an impact on the amount of charge that will be generated in an event and as a consequence the resulting event PHA. This effect can be seen in the plot below which shows the PHA distributions for the bins with the longest and shorted delta-times between events. As with the radius of encircled counts, there is a trend in the PHA distribution to lower PHA as the delta-time decreases as shown below. The pronounced drop-off in PHA begins at delta-times below ~0.05 seconds.